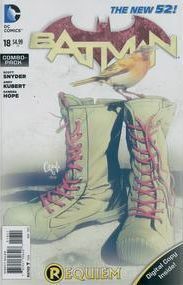 - Welcome guest-artist Andy Kubert! - In the wake of unspeakable tragedy, Batman is in danger of losing his humanity! - Fan-favorite character Harper Row returns-will she be able to pull Batman back from the brink? This issue is also offered as a combo pack edition with a redemption code for a digital download of this issue.